April 30 deadline – No fooling! Dana Phamova’s tile for the FIMO50 World Project shows off her fascination with color, light and shadow. Her 4″ tile could be a modern painting, a mosaic, or a collection of pieces from a Monopoly game. See more of Dana’s color studies here and here as well as on Flickr and Instagram. The tiles from American artists continue to pile up in my studio until April 30 when I’ll box them up together and whisk them off to Germany. You still have time to mail yours to me in Ohio. Let’s make a great showing. A sampling of entries are fun to study on Fimo50WorldProject. (Instagram updated its system forcing me to learn a new routine. Not to worry if yours hasn’t shown up yet. Check back.) Now off to the studio to finish your tile! Anna Hanzalkova (YellowJacketAngel) posted her spring collection on Facebook. 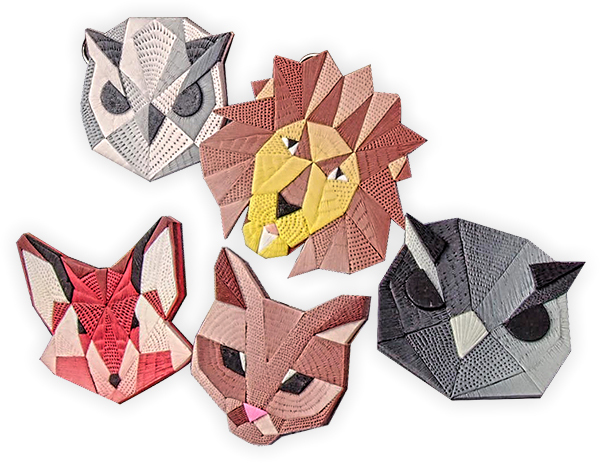 Her menagerie of charming animals is constructed mosaic style in geometric gradients. Then she adds texture so that the pieces appear almost quilted. It’s a fresh effect that’s sure to be a hit. Anna is from the Czech Republic and she’s part of the gang who published the Polymer Clay Heaven book/tutorials on their Etsy shop. If you click through her pictures on the IPCA post, you’ll see that she’s also using tassels and fibers as jewelry findings in her new line – another trendy approach for spring/summer. 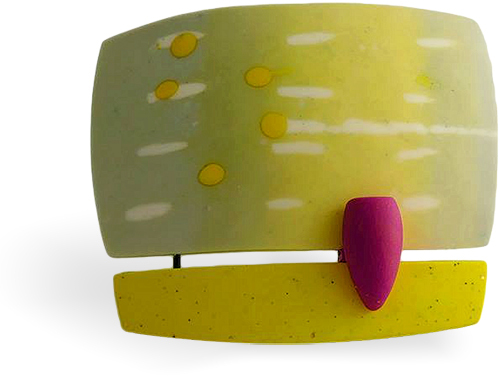 The spring colors of Angela Guertel’s latest brooch bloom with hints and colors of spring. Her Flickr page shows works that you may recognize as thoughtful twists on well-known processes to which Angela has added her own ideas. For instance, these black and white beads were made with Kor tools along with some handmade patterns. Angela backfilled the graphic patterns for effect and strung them with textured polymer spacers. Her spring brooch and other reinvented works are on Facebook. 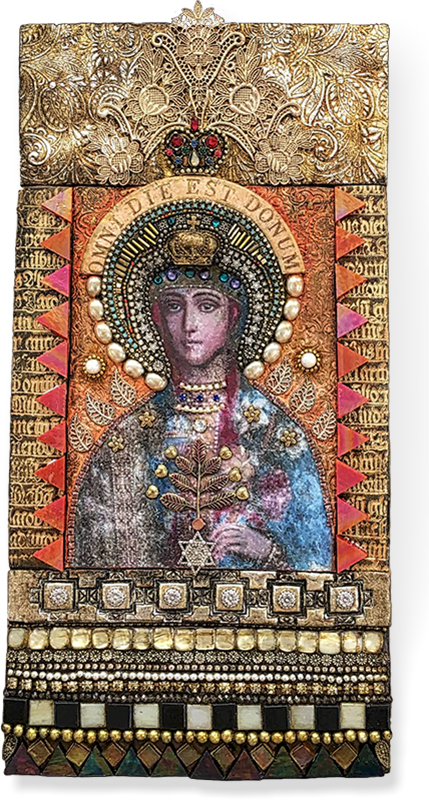 This 12″ mixed media plaque Omni Die Est Donum (Every day is a gift) from Laurie Mika looks right for Easter. Laurie is home from Portland’s Art and Soul where students quickly caught on to her rich mosaic, mixed media, baked-in antiquities. She talks about her experiences on her most recent blog post. 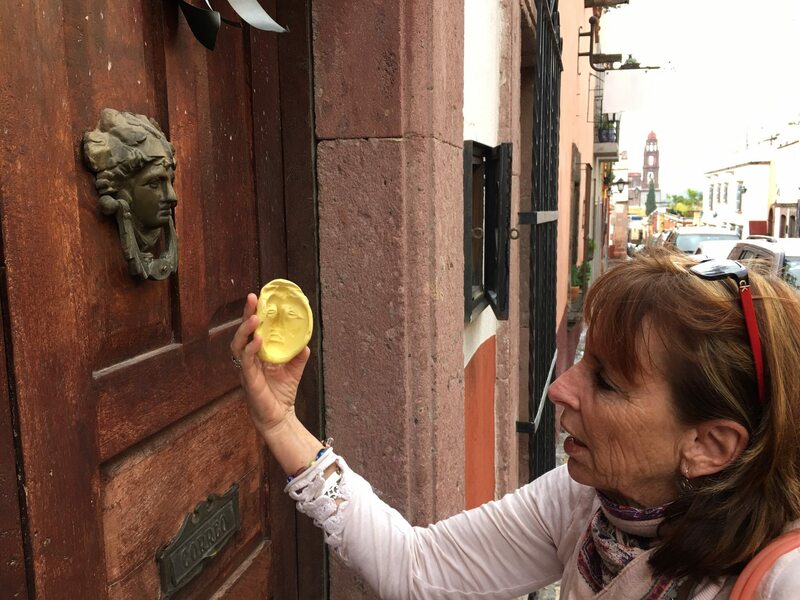 See how Laurie gathers her inspirations and makes molds when she travels. Would you have the courage to do this? Wander through her modern antiquities on Facebook, Pinterest, and Instagram on your Happy Easter weekend. Martin Pottjewijd, freelance graphic designer and sculptor from the Netherlands, likes to mix polymer with rock and sometimes with boulders! “My work varies from an array of strange characters to architecture from different worlds and bygone days. With my work I want to make the world more colourful and make people smile,” he explains. 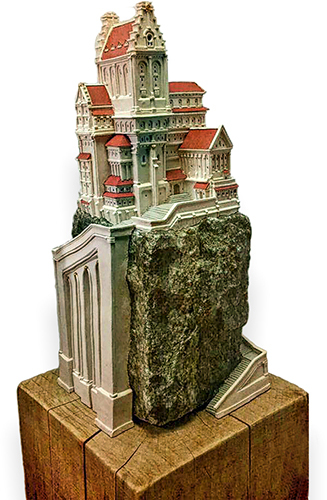 See more of his castles and characters on Facebook and his site. Martin was also the creator of The Adventures Polly and Mur comic strip (sponsored by Polyform) that appeared in the From Polymer to Art magazine.